A bluebird chick asking to be fed. 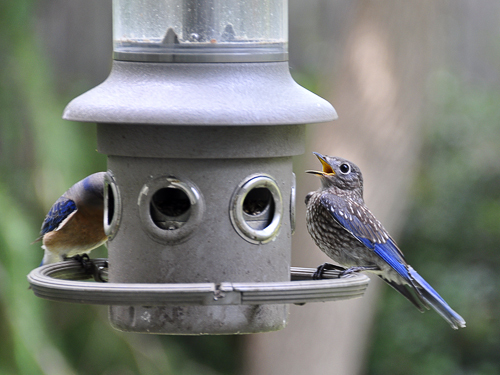 In the end, the bluebird couple which earlier visited our birdhouse so many times didn't seem to like the lodging but they did like the food. The whole family, both parents and their four chicks are now visiting the feeder several times a day. 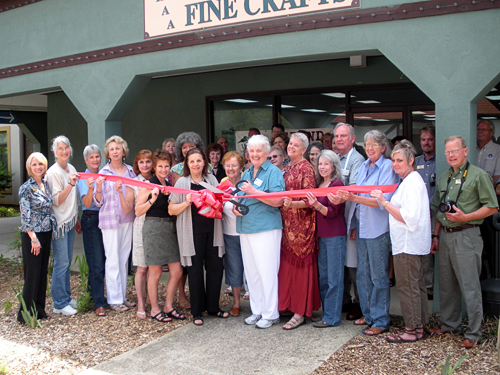 Ribbon-cutting ceremony at the Georgia Heritage Art and Fine Crafts Gallery located in Helen, Georgia. New for 2012: The Hills of Helen Desk Calendar. 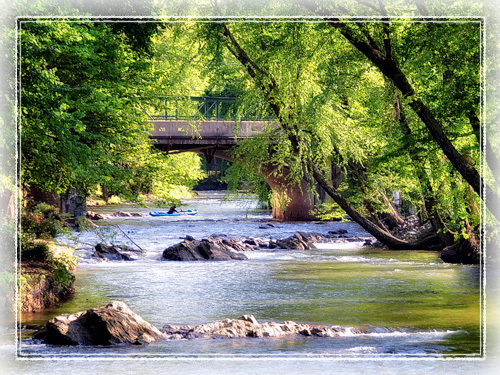 Nestled in the foothills of the Appalachian on the Georgia side, hugging the Chattahoochee River, Helen has the look and flavor of a Bavarian alpine town. At only two hours from Atlanta, it's a tourist attraction that offers beautiful views to its residents and visitors especially during late October and November when the leaves change colors. You can now enjoy some of those views year-round with our new desk calendar. I have now had more than two weeks to reflect on the hail storm which hit our house, ruined parts of our garden and damaged the roof of our home. This storm was followed by more storms last week which created so much destruction and deaths through so many southern states. When I woke up the following morning after the first storm and saw my garden, I was sad. I had put a lot of time and effort into it and I enjoyed watching my flowers and listening to the birds sing. Later we got the news about the roof, the broken vents and the dented window. Not just us but the whole neighborhood and for a couple of days we all talked and commiserated about it. Then came the storms of last week destroying everything in their path. Even in Georgia, where the areas affected weren’t as extensive, they caused a lot of damage and even a death. 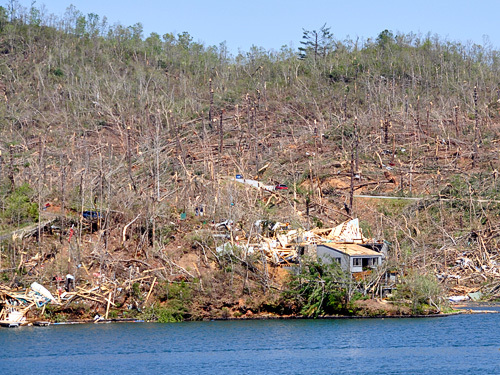 We saw the path of the tornado that hit Lake Burton, in Rabun County. On one end of the lake, everything looks fine, on the other, the same, a peaceful place and even some boats in the water. And in the middle, there is utter destruction. Pieces of wood, walls and roofs are half on the ground and the other half on the water. It looks like a forest of just trunks; there are no branches, no leaves. A heartbreaking scene. And now I realize how lucky we were - to the point that I feel ashamed for having felt bad about my garden and house. So many people lost their houses, their livelihood and even their lives. My heart hurts when I think about it. I know they will rebuild, it’s in our nature to pick up the pieces and keep going. But with the lives that were cut short we will never know what promises they entailed, which songs will not be sang, which colors will not be painted and which discoveries will not happen.